On April 6th, the widely speculated Nokia Lumia 900 is finally official and catches numerous closet fans’ eye at New York Time Square. 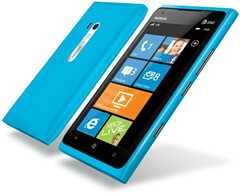 It is the first LTE-capable Windows Phone mobile device from Nokia. Features with 4.3" AMOLED ClearBlack glass touch screen, one-piece polycarbonate body, excellent antenna performance, 800 x 480 pixels on the resolution scale, 512 MB RAM / 16 GB memory capacity and all day battery life, all of these advantaged superiorities definitely make Lumia 900 a most suitable mobile DVD player. Why we need the Nokia Lumia 900 DVD converter? Getting rid of the heavy DVDs and place-limited home DVD Player, and watch videos and movies on mobile phone is becoming a fashion and an important enjoy during our daily life. However, as we known, not all types of media files can be played successfully on Nokia Lumia 900. From the Lumia 900 official website we can know that Lumia 900 supports only limited video formats. What video formats Nokia Lumia 900 can support are such as WMV 9, H.264/AVC, MPEG-4, 3GPP formats (H.263), AVI, VC-1 and ASF. Watching DVD movies on Nokia Lumia 900 sounds cool but complicated at first heard. But with the help of DVD to MP4/M4V/MKV converter, it can be a very easy thing. Just a few steps, you can enjoy your favorite DVD movies on your mobile DVD player Nokia Lumia 900. 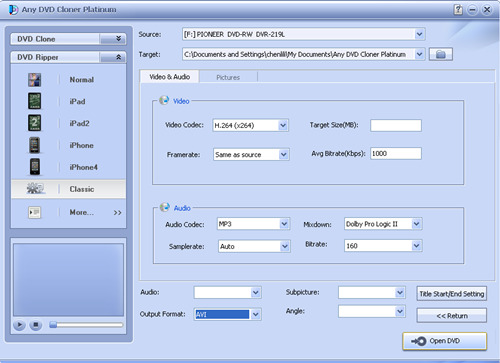 Any DVD Cloner Platinum is a powerful combination of DVD cloner and DVD ripper. As a DVD ripper, it can rip any DVD to MP4, MKV, M4V for Nokia Lumia 900, iPod, iPhone, iPad and many other mobile devices to watch. 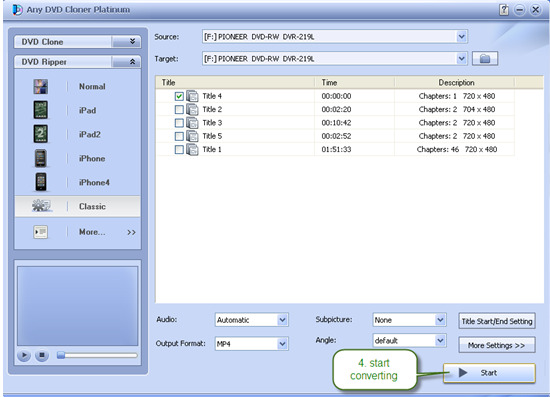 Fast encoding speed, Brief and easy to use interface and operation allows Any DVD Cloner Platinum becomes one of the most popular DVD converter around the world. Now you will know how easy it is to watch movies with this professional Nokia Lumia 900 DVD Converter. How to easily watch DVD movies on Nokia Lumia 900? It takes a few steps to convert DVD to MP4 for playback on Nokia Lumia 900 with DVD to MP4 converter. 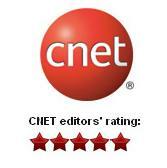 Click here to download Any DVD Cloner Platinum. Step 1: Insert DVD into DVD burner and launch Any DVD Cloner platinum, Any DVD Cloner platinum can recognize the your DVD burner path automatically, then click "Open DVD" button to load the DVD structure. Step 2: Change the "Output Format" to MP4, MP4 for playback on Nokia Lumia 900. Note: MKV, MP4, and M4V also can be selected for playback on other portable players. Step 4: Click "Start" to begin the ripping process. Step 5: Transfer the file to your Nokia Lumia 900 and enjoy the movie! That's just the whole conversion process, isn’t it easy and magical? “Live more, do more” With this good Nokia Lumia 900 DVD converter, you can easily enjoy your favorite DVD movies whenever and wherever as you like. Note: The program will automatically replace the previous ripped movie with the newly converted movie in the output folder. Thus, you need to manually transfer your converted movie to another folder once the program finishes converting a DVD movie. When the converting process finished, find out the video file in "Target" folder, then you can transfer DVD movie video to your portable devices such as mobile phone, MP4 player etc for playback, have fun anytime and anywhere! 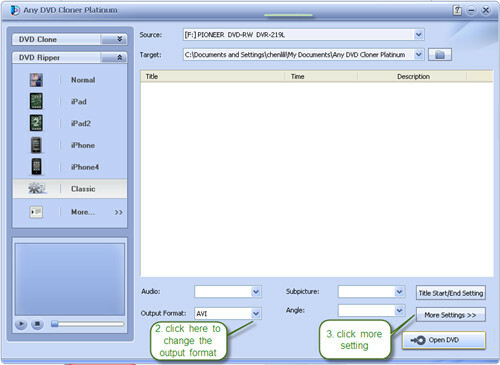 Click here to download the user manual of Any DVD Cloner Platinum.